Burnley striker Sam Vokes hopes to be involved in Wales' Euro 2016 qualifying campaign after recovering from a serious knee injury. The 25-year-old ruptured his anterior cruciate ligament in March, but is nearing a first-team comeback. "It's a been great start and I want to be involved. To watch the boys do so well has been fantastic," he said. Wales are currently second in Group B having won two and drawn two of their opening four qualifiers. Their next match in the competition is away to leaders Israel on 28 March. 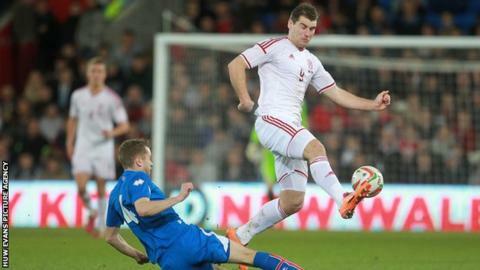 Vokes says he hopes to regain his Wales place once he has re-established himself in the Burnley side. "It's about playing for Burnley first and foremost and then getting my fitness back to play for the national squad. "It's a great squad to be in at the moment." Vokes played his first 90 minutes since his injury for Burnley's Under-21 side on Tuesday. He is expected to make his Premier League debut for the club over the festive period, but manager Sean Dyche says he will not rush the striker. "It was great to get a full 90 minutes under my belt," said Vokes. "The knee was alright, my lungs were struggling though," he joked.